Boy howdy, did I ever jump the gun on this recipe. 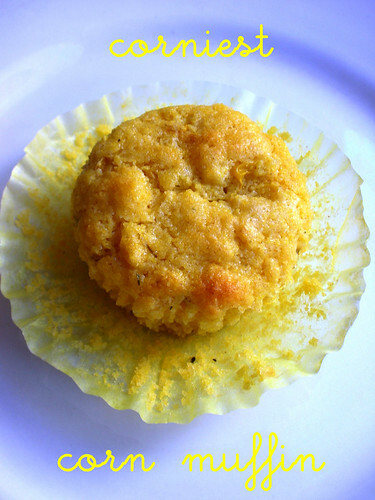 I made these Corniest Corn Muffins all the way back in 2008. We were still living in Sydeny…sheesh. But I do remember them. Even remember that we ate them with turkey chili instead of for breakfast (I reduced the sugar to 4 tablespoons for that reason). Corn muffins are really little cornbreads. I’m well aware of the North vs South cornbread rivalry that divides a large chunk of our nation. I, however, did not grow up in a home with fierce opinions about “proper” cornbread. My parents were raised in the Midwest, and I don’t think this debate ever even crossed their minds, so, as a result, I, too, am a bit of an agnostic when it comes to cornbread. I’ll tell you what I liked about these muffins, though. I liked the kernels of fresh corn that gave them extra texture and craggy, golden tops. I liked their crumbly, grainy crumb and their little bit of sweetness. I’ve inherited my Grandpa W’s old cornstick molds (like these ﻿only vintage! )…perhaps I should see if these muffins make good sticks, too? For the recipe, see Baking: From My Home to Yours by Dorie Greenspan (it’s also here on Diner’s Journal) or read My Next Life, as it was Jill’s pick this week. Don’t forget to check out the TWD Blogroll! The texture looks perfect and scrumptious! Oh, I like the idea of those little corn molds…so cute. Of course, these are plenty cute as well. They were a hit here…of course, we had a divided batch for those who are very peculiar in their thoughts of no corn kernels in cornbread. Married all these years and never suspected. Yum! When you use the stick pan, let us see them. I always think they are so cute! I like the look of your muffin! Great post! I made these way before they were chosen too! They’ve become a big favorite at my house since then. Ohhh you are so lucky to have those vintage corm molds!! I made these a few years ago too and loved them. The kernels definitely make these. Yours looks delicious.